« Win a Pair of Tickets to the Dark & Delicious Petite Sirah Bash in Alameda! Offering the counterpoint to last week’s discussion of Biodynamic viticulture with consultant Alan York, we continue the coverage of Biodynamics by talking to its most vocal critic in the U.S.: Smith-Madrone’s Stu Smith, who, aside from making some very tasty conventionally-farmed wines in Northern CA, is the author of the controversial blog Biodynamics Is A Hoax – the title of which pretty much tells you where Stu stands when it comes to the debate on BioD. In our podcast interview, Stu braves being under-the-weather to talk about why he felt the need to create his anti-BioD blog, explain why BioD might not be as beneficial to the environment as you might think, all while we alternatively compare Biodynamics to religion, the autism / child vaccination debate, and the recent Iraq and Afghanistan wars (roughly in that order). It’s a fun and controversial listen, and I hope to discuss and debate several aspects of it with you all in the comments. Get those headphones ready and Buckle up for this ride! Very interesting. I missed the interview with Alan York, I will have to go back and listen. I find most people have no idea what Biodynamics mean, I have heard it explained using the definition for organics numerous times. Congrats to you Winedude for getting these guys to go on record, I don't know who else could have done it. I also need to go listen to Alan's interview. I come at this as having been a Demeter Certified Winegrower. Very interesting! Darek, What was your take on the Point-Counterpoint? Thanks, Darek! Would love to hear more of your viewpoints after you hear the other side of the argument. Cheers! Listened to the whole interview. It was concise, and to the point. What I think is the best is how articulate and thought out Stu's points were. Needless to say I was a fan already of Stu, I really hope supporters of the BD religion can understand why Stu makes so much sense and why Biodynamics is truly a hoax. Very pleased 1winedude that you've read Dawkins, tell the BD people you've taken a side!!! Thanks, Isotope – can't say I've fully taken a side yet, but I will have some follow-up thoughts soon on where I stand after these interviews. Cheers! Joe: Fantastic interview. I'm a huge fan of Stu's blog (and his pull-no-punches approach), so I really enjoyed listening… and learning that he's as smart (in audio) as he seems (on his blog)! Having spent a significant amount of time researching Biodynamics for a start-up vineyard, it's interesting to hear the point and counter-point… Thanks for the interviews, Joe! We have chosen NOT to go for the Biodynamic/Organic certifications for a variety of reasons… The claims are not backed, it is costly, and the organic sprays can actually be more harmful than synthetic ones. We ARE attempting to be as environmentally friendly as possible, but in our situation, the certifications would actually impede us… go figure! Thanks, ANewVine – great to hear from someone who has recently dove into the depths. You're conclusion is similar to the one that is formulating in my mind, now that we've gotten to hear some takes on both sides of the BioD argument.Cheers! Very enjoyable and informative. I follow the BioD debate and am fascinated at the passion each side has for their viewpoint. For one who throws around the "ignorant" label frequently, he has some serious blind spots with regard to both BD and to science in general. For someone who claims he's taking on BD because of false claims of superiority, he all too frequently wraps himself up in a flag of righteousness and makes unsupported remarks about his own farming. If the guy would dial back the belligerence he'd be able to find more BDers to talk with, and hence would understand the mindset a bit more. A shame, 'cause a lot of what he says has merit. Thanks, Enoch – another thing I'm surprised hasn't come up yet is whether or not Stu is using the platform to bring more attention and sales to his wines. I am VERY sure that he would have a compelling answer to that question and could show that he's not abusing the pulpit, but answering that would also raise the credibility I think. Still, I figure that the number of people who will become long term custoners of Smith-Madrone because of this are probably pretty limited. There is a certain segment of population to whom these types of issues have become paramount. Most, though, will probably look at his actions as tinged with negativity (he admits as much) and a bit obsessive, and simply walk away. I have little truck with BD, and don't mind a vigorous challenging of its assertions. good job Joe, a good set of questions, and you gave Stu a chance to elaborate on his point of view. Always interesting to hear the voice behind the blog. I do not think there there will ever be a winner or loser in this debate, I just hope that the participants continue to respectfully disagree. I'm no fan of Steiner, and I am also skeptical about the limits of science, so I too am still looking for a third way. Thanks, Todd.To your point about the debate never being concluded, I hope people aren't taking me the wrong way in my conclusions on the follow-up article to these interviews. I'm not saying that BioD is total B.S., I'm saying that until the cert. is more transparent and addresses the gaps of using potentially environmentally harmful preparations and producers more scientific evidence to back up its claims, then we need ot be VERY skeptical of it being superior to other farming methods, and that grapegrowers shouldn't feel compelled to get certified when they could go organic and add in some of the BioD principles and methods as they deem appropriate, without going all the way.This especially holds more water I think when you couple the info. presented interviews with the studies that suggest that wine consumers don't consider BioD or organic certs. as all that important when buying wine.Cheers! I heard Mr. York give a talk a few years ago and it was one of the most incoherent and rambling presentations of wine-growing philosophy I've ever heard in public. His shtick didn't fly in a room filled with experienced farmers and winemakers. Mr. York is a smooth talker who seems to be completely at ease perpetuating the Big Lie – the message now in the MSM stating that BD growers do not use any pesticides on their vines. Why not be honest? Why not try to correct this type of information which presents itself time and again in the media – as well as from his own clients? The answer for me is twofold: For one, BD doesn't really deal with the truth in any scientific definition of the word – so why start now. Secondly – I can only assume he and others wish to take advantage, using misinformation along with public misconception – for a marketing advantage. 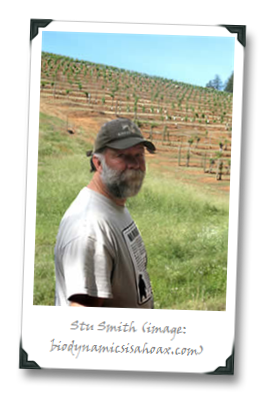 Also, why would you categorize Stuart Smith's wines as conventional? He's clearly on the pathway of sustainability, Just more of the "if you're not organic or BD you're conventional" nonsense. Thanks, Rich. Put yourself in my shoes – I have to pick *some* bucket to put Stu's wines into, in order to quickly describe them. “Conventional” is accurate I think, in that Stu's not certified Organic or BioD, and I think Stu would agree with that classification. Just because you're not organic or BioD doesn't mean you aren't sustainable.Cheers! With all due respect, as you are hosting this complex debate, I would expect "your shoes" to be more informative. "Conventional" has become too vague a definition, especially now that in some circles it is used as a pejorative. I agree with your last point however I do feel strongly that there are differences using a sustainable approach and a conventional one and these differences are clouded by your "bucket" system. The more up to date definition of conventional in my opinion is associated with wines produced on a large scale and in an international style in lieu of terroir focused production. Is this accurate enough? Probably not, but in terms of real, reproducible agricultural methods and philosophy, sustainability has every reason to stand apart from conventional. Rich – consider me convinced. You raise some great points and I will make sure to qualify how I categorize those grapegrowing practices in the future. Cheers! Cheers my man. Keep up the great work! 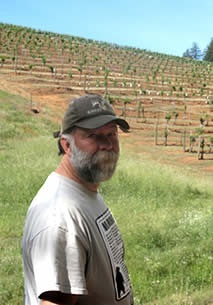 I number of years ago I did some vineyard work for a Winery in the area between Napa and Calistoga. Their wines are some of the most wanted and expensive wines in the area. At the time, the vineyard manager told me that they were trying BD in a 5 acres plot, The BD guy (do not remember his name) asked for the history of the vineyard and picked the 5 acres that had mildest pest and disease history for his trial. The vineyard manager said that if he did not sprayed the 5 acres at night when the BD guy was not there, the fruit was going to be ruined, so he did. At the end of harvest off coarse the BD guy took the credit for the quality of the harvested fruit. He is not longer there and the vineyard is farm sustainably producing excelent wines every year. The way to go…IMHO, organic farming (certified or not) and if you need to spray non organics to save your crop, you do it. The wines. If you drain 20%-30% of the juice from your tank before harvest, you will get richer, more concentrated wines no matter if the grapes are BD, organic or full of chemicals. They tasted the same. Actually, I have seen soil samples from biodynamic farms and farms laced with chemicals, and there is a huge difference. The biodynamic soil is full of organisms, crumbly to the touch and retains more moisture. Chemically treated soils are devoid of life in general and often as hard as a rock. That is something that can be scientifically proven. HI Kathryn – I have seen a similar demonstration in France, though it wasn't with BioD soils, it was with organically and sustainably farmed soils. So I'd say BioD isn't the only method for ensuring soils stay healthy (but not too healthy, the vines need some stress! :). 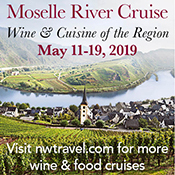 Trackback from Terroirist » Blog Archive » News Roundup: Napa Valley Shore?